Bold. Engaging. Helpful. Wall calendars to be seen all year round. If you want to be seen every single day, a calendar up on a wall is the solution. Whether it’s for your office space or for your customers, you’ll always be kept in mind when it comes to planning time. Our wall calendars come in a full range of sizes, with a choice of silk, uncoated or gloss paper in variety of stocks. 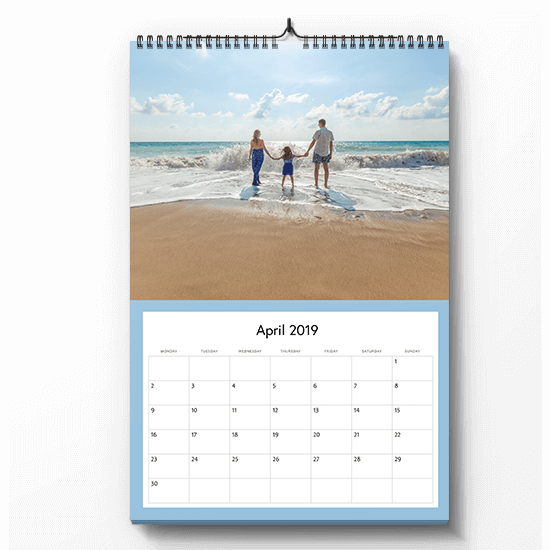 And all our calendars are wiro bound along the long or short edge of your calendar, so you can upload your artwork in portrait or landscape. A3 (297mm X 420mm) A4 (210mm x 297mm) A5 (148mm x 210mm) 210 mm Square Letter 8.5" x 11"
Youloveprint is rated as $reviews.score out of 10 by TrustPilot based on $reviews.count reviews. We ask for a 3mm bleed on all desk calendars. Please do not include any important content within this area. Only wiro binding is available for wall calendars. Whether you choose portrait or landscape, the binding will be across the top of the wall calendar. Before you can complete your order, you must make sure all page placeholders have been completed. For example, if you are ordering 13 pages, all 13 boxes must be filled. If you do not have enough content, you must add blank pages.